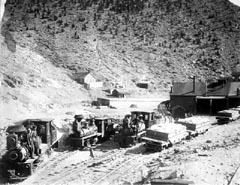 The story of the Gilpin Gold Tram starts in April of 1859 when John H Gregory started up Clear Creek from Golden searching for gold. Gold flakes were being found in the creek, so the question was, where was the gold coming from. Working up the creek and following the north branch of Clear Creek at what is now know as Forks (for years, a station and restaurant, now a traffic light), Gregory found the richest gold dust in what is now called Gregory Gulch above Black Hawk. The Gregory Lode had been found. The news of gold hit the nation. By September, a population of 900 in log shanties and tents had invaded the valley. By the summer of 1860 sixty ore mills and thirty arastras (a kind of ore grinding pit) were in operation and the population had risen to 15,000. 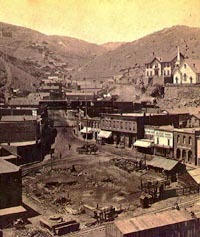 Soon numerous mining camps had sprung up including Black Hawk, Central City, Nevadaville, Russell Gulch and Apex. But by the mid-60s, the easy gold had been mined out. Gilpin county came on hard times. What was needed was both better technology in milling, and a means of transporting the ore from mine to mill and mill to the rest of the world. New technology did come, with the first smelter being setup in Black Hawk in 1865. As for transportation, that came in the form of the three foot narrow gauge Colorado Central. The CCRR was formed in 1870 with construction starting in September of 1871. Based in Golden Colorado, the trackage worked it's way up Clear Creek, splitting at Forks with the first branch going on to Black Hawk. 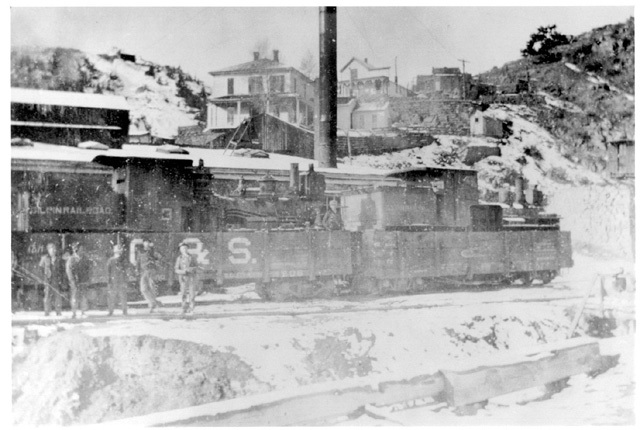 The train arrived in Black Hawk on December 15, 1873. The mills now had a way to get their product to Denver and the world beyond. 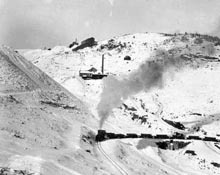 In 1878, a switchback extension was built the one mile distance from Black Hawk to Central City with four miles of trackage, and the first train arriving on May 21 1878. The problem still remained on how to economically get the gold bearing quartz ore down to the mills of Central City and Black Hawk. It was a dangerous, slow and expensive process to bring the ore down in horse drawn wagons. In the summer of 1886 five mining men met to solve the problem. The solution was the Gilpin Tramway Company, formed on July 29th in Central City by Henry C. Bolsinger, Bradford H. Locke, Robert A. Campbell, Andrew W. Rogers and Henry J. Hawley. The purpose of the company was to build a two foot gauge railroad to transport ore from the mines above Black Hawk to the mills. Grading was started in May 1887. A frame barn was purchased above Black Hawk as an engine house. The first rails were laid on July 1, 1887. Shay #1 arrived on August 26th, with it's first run on September 1. Trackage worked it's way back down Clear Creek climbing the side of the hill and climbing up into Gregory Gulch. Maximum grade was six percent with several curves having a 50 foot radius! The trackage continued on above Central City (there was an excursion train for Central City residents from where the tram crossed Eureka Gulch to Black Hawk on September 29, 1887). From there the trackage continued up to Nevadaville, Quartz Hill and Russel Gultch. Much of the altitude gained by the Gilpin was done by the use of switchbacks. The Tram had more switchbacks than any other American railroad. At one point, seven switchbacks were used to reach a single mine. The railroad was not without it's opponents. The Gilpin was in direct competition to the various teamster outfits. An agreement had been made with the Colorado Central to lay a third rail through Black Hawk to allow the Gilpin to reach it's various mills and smelters. Mayer William Fick, associated with many of the teamsters, fought to stop the Gilpin from coming through 'his' town. The third rail was laid after various legal actions starting in December 1887. But that was not the end of it, in April 1888, the Mayer accompanied by the marshal ordered laborers to stop laying the third rail and to start removing trackage that had already been laid. Fick declared that the tram would throw teamsters out of work, a great calamity for the city. But with a payment from the Gilpin of $450 to the city, the Mayor was advised to quit his losing fight, and none of the trackage was removed. Ore and supplies were not the only cargo carried on the Gilpin. On May 23, 1888 the tram received six new excursion passenger cars. As with many other railroads in the west, tourist traffic created a good supplement to the railroads income. Excursions occurred throughout each summer. A round trip from Black Hawk with lunch was 75 cents. A combined trip on the Colorado Central from Denver was $2.40. Throughout 1888, track was extended to mines and mills leading to fifteen and a half miles of track by winter of that year. Once winter arrived, a new and interesting problem arrived as well. Ore comes from wet ground, and in the winter, it has a tendency to freeze solid in the cars before delivery to the mills. The tram solved this problem with a unique solution. A warming house was built near the engine house with tracks running it's entire length. Steam pipes and stoves warmed the building to a high of 120 degrees, thus keeping the ore warm and dry. Traffic continued to grow throughout the 1890s, with three Shays taking up the load. Accidents did happen on occasion with engines jumping the track and rolling over. By 1900, new shays were replacing the old ones. In January 1899, the Colorado Central (then owned by the bankrupt Union Pacific) was taken over by the Colorado and Southern. The Gilpin had been showing a nice profit in the early 1900's so by 1905, the C&S was looking at the Gilpin as a likely acquisition. On June 27, 1906, the Gilpin was sold to the Colorado and Southern. 1910 saw the Gilpin at it's greatest length of 26.46 miles including spurs and sidings. But unfortunately, the C&S bought the Gilpin at the height of it's profitability. The profit margins on mining gold was dropping both due to increased cost to extract the gold, and fixed prices in the gold market due to government. As such, traffic was dropping. Soon the Gilpin was running in the red. The last train ran on January 17, 1917. The railroad was sold for scrap in June of 1917.